Joel Willans talks Spellbound in Finland’s English language magazine, SixDegrees. Words by Joel Willans. Photos by Adam Monaghan. The Quiet Calls performing ‘Silver Rider’ at the Spellbound book launch. 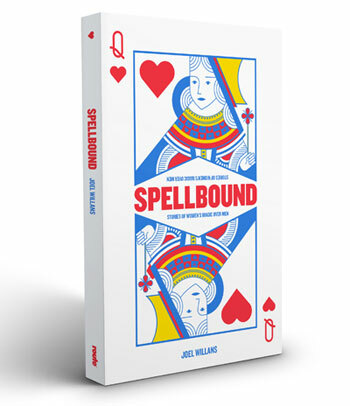 Joel Willan’s Spellbound – Stories of Women’s Magic Over Men will be launched at Luckan, Simonsgatan 8, Helsinki, Thursday, 17 January 2013 at 7pm. To accompany readings, there will be music from The Quiet Calls and photo exhibition inspired by Spellbound, courtesy of photographer Adam Monaghan. Ever since men painted on cave walls, they’ve been making art out of their feelings for women. Byron and Keats did it with words, Bowie and Lennon did it with music. Joel Willans’s prize-winning stories feature men battling for women’s hearts with weapons as diverse as chocolates and chairs. Inspired by sweet love and bitter breakups, boundless suffering and one-sided adoration, these stories promise a spellbinding read and a unique insight into women’s magic over men. Since leaving the English county of Suffolk, Joel Willans has lived in London, Vancouver, Helsinki and an Andean village in the Peruvian department of Apurímac. Currently, he lives in the Finnish countryside, in a converted hospital sauna, with his wife and two children. A partner at the communications agency, Ink Tank, his prize-winning stories have been broadcast on BBC radio and published in dozens of magazines and anthologies worldwide.